Comments: Broadleaf deciduous tree native to the eastern US and Canada. Pinate leaf with 5 to 7 finely serated ovate leaflets, walnut like fruit, and gray scaly bark. Broad spreading branches gives this tree an oval skyline. 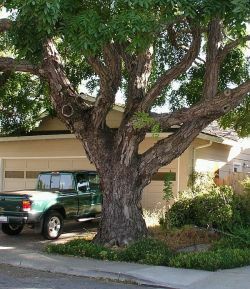 An unusual tree for California, but not rare.